The Argus Monitor is found within Southern New Guinea and Northern regions of Australia. The New Guinea variety V. p. horni is more commonly available in the hobby. Males reach lengths of 120-150cm and females smaller at 90cm. What does an Argus monitor look like? The Argus monitor is a large lizard with females growing to around 3.5 feet snout to tail length (STL) and males attaining around 5.5 feet STL. The upper body base colouration is grey with bands of yellow eye spots down the body. The underside is cream to bright yellow, particularly around the neck. They have a lean body shape and are powerful, hyperactive lizards. Where are Argus monitors from? Argus monitors (Panoptes horni) are native to southern Papua New Guinea and are found in grassland savannahs. As a result of their natural habitat they have the ability to tripod to get a better view of their surroundings. How do I keep Argus monitors? Argus monitors should ideally be housed separately as adults but can be kept together as pairs providing the are watched for signs of aggression, particularly while feeding as they are extremely food orientated and will not even think twice about ripping a chunk out of their cagemate or your fingers! For this reason they should ideally be kept separately unless for breeding. The use of long forceps and snake grabs is a must when feeding and should never be fed by hand due to the chance of serious injury. 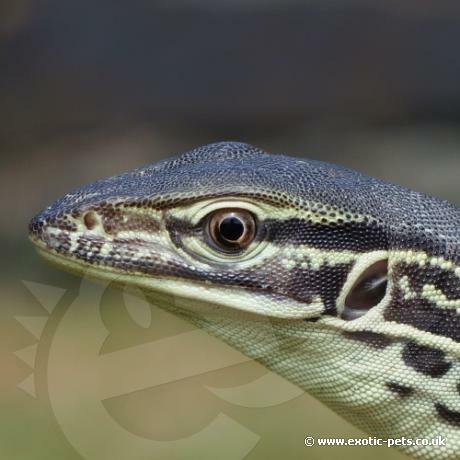 Due to these being very active lizards the enclosure should be as large as possible with a minimum floor space of 10 feet X 4 feet and the bigger the better! A young Argus can be kept in an enclosure with a floor space of 6 feet x 3 feet but will soon outgrow this in its first year. Also well fitting locks are essential as Argus are quite intelligent and will find any weak spot in the housing. The ambient temperature should be around 30°c with a heat spot of 45°c-50°c and a cool end of around 25°c. Night time temperature should drop no lower than 22°c. A daily light cycle should be between 12-14 hours during summer months and 8-10 hours during winter months. A good broad spectrum UV lamp should also be used to keep them healthy. Argus monitors love to dig and so deep substrate is ideally required. Substrate for an adult enclosure should be around 2 feet deep and should consist of a 40/60 chemical free sand/soil mix, kept moist but allowing the surface to dry. They are also good climbers and will utilise any climbing space given. This will also increase their surface area. Just ensure any branches or logs used are sturdy enough for the monitors to climb and are secured. Plenty of hide boxes, corkbark trunks and even plywood sheets placed on the substrate surface should be available to help the monitor feel secure and dig beneath. A large water container, large enough for the monitors to emerse themselves is also needed and should be changed daily. Argus monitors are carnivores and will eat anything from crickets up to small rats depending on the size of the monitor along with calcium and vitamin supplements. Young should be fed daily until full and nearing 3 feet. Adults can then be fed three to four times a week. Argus monitors are very entertaining and rewarding to keep providing you can give them the correct husbandry they require. These animals are not a species for beginners and must be kept by experienced monitor keepers and enthusiasts only. Please be aware upon purchasing this animal we will need to speak to you regarding its care, before releasing the order for dispatch.